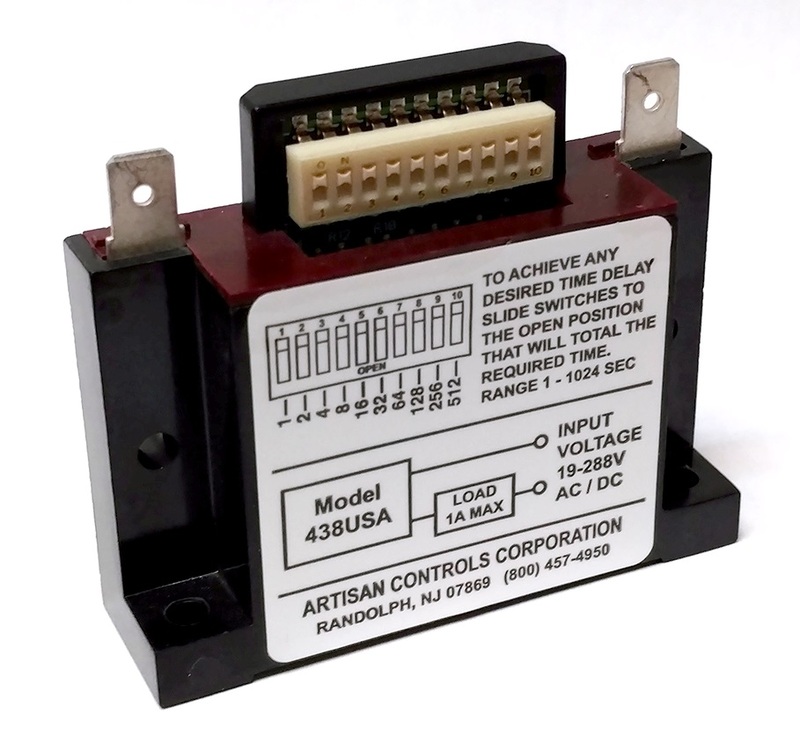 The model 438USA (Universal Switch Adjustable Time Capsule) is an all Solid State timer providing Delay on Make control to any load operating from 19 to 288V AC or DC. Timing is set via a binary coded dip switch and is adjustable from 1-1024 seconds. When power is applied, the 438USA remains in the off state. When the preset time period has elapsed, the 438USA switches on allowing the load to energize. The load remains energized as long as power is applied. For timing ranges 0.1-102.4 and 2-2048 seconds pleaser refer to our product 438USA-X. Operating Voltage 19-288VAC or DC, non polarized. Output 10 milliamperes to 1 ampere inductive. Inrush to 25 amperes for 8 milliseconds. Timing Mode Delay On Make. Timing Adjustment 10 position Dip switch located between power terminals. Opening of any switch position adds its associated time value to the total timing period. © 2012 Artisan Controls Corporation. All rights reserved.